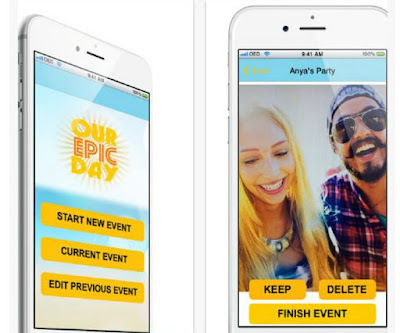 Our Epic Day is a new slideshow app available for iPhone, iPad and iPhone touch users. It is an app that automatically creates classic slideshows for you on the fly, with minimal effort. It is a very useful app for people that love to create fun and memorable videos of events from their lives. It is designed with the user in mind, so expect an easy to use interface. Its HUD design has all the features that you might expect from a newly developed app. It has a very modern and sleek design to it that everyone can enjoy. The app creates fun and memorable slideshows in a very smart way. Using the app, you can add new daily events to the app’s “calendar”, which you can name and customize as you see fit. There are many features that make this app unique. For example, it can remind you to take pictures during an event, in 15 and 30 minute intervals. This is great for people that are on vacation and like to party daily. Even though this feature can be turned off, we recommend keeping it as a lot of times we forget to take pictures during parties and events. The app has tons of other cool features, like built in sound tracks, mp4 format videos and more. If you want to find out more about the app, we recommend that you visit their official website or find and download the app directly from the App Store.